In this photo taken July 24, 2017, a car passes the building of the Federal Security Service in Lubyanskaya Square in Moscow, Russia. Russia has detained an American citizen in Moscow on accusations of spying, according to Russian state media. Russian Federal Security Service (FSB) officials issued a statement on Monday saying U.S. citizen Paul Whelan had been detained on December 28 “while carrying out an act of espionage,” and that they have opened a criminal probe. They provided no further details, but Russia’s state-run TASS news agency said that Whelan faces up to 20 years in prison if convicted. A State Department spokesperson said Monday the United States is aware of Russian authorities' detention of a U.S. citizen. "We have been formally notified of the detention by the Ministry of Foreign Affairs," the official said in an emailed statement to VOA. "Russia’s obligations under the Vienna Convention require them to provide consular access. We have requested this access and expect Russian authorities to provide it." The State Department did not provide further details, citing privacy concerns. 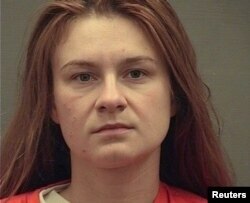 The arrest coincides with several spy scandals that have exacerbated tensions between Russia and the West, including the poisoning of former double agent Sergei Skripal and his daughter in Britain, along with the recent U.S. conviction of Russian citizen Maria Butina for acting as an illegal foreign agent. FILE - Maria Butina appears in a police booking in Alexandria, Va., Aug. 18, 2018. News of Whelan’s detention came less than 24 hours a after Russian President Vladimir Putin issued a New Year's greeting to U.S. President Donald Trump in which he said Moscow is amenable to a continuing dialogue with Washington on a range of topics. In 2016, Izvestia, a Kremlin-aligned news outlet, reported that there were 13 U.S. citizens in Russian jails at the time. The Kremlin has not since published any details on other Americans currently in Russian detention.